Kanban - the next step in the agile evolution? Article: Test Automation: Prevention or Cure? I think writing functional tests in a given-when-then style manner is a great idea. Tests tend to be clearer and more precise when written this way. There are quite a few tools too choose from. Cucumber by Aslak Hellesøy seems to have a lot of momentum these days and is an acceptance testing framework definitely worth considering. However, the customer I work with has been using Fitnesse for a number of years now, which means people are familiar with this framework. So going for the new Fitnesse Slim framework seemed like a step in the right direction. I quickly had some tests up and running, and with Fitnesse running inside Eclipse my cycles were really short. Having learned the basics I felt an urge to learn more and therefore decided to watch some of Uncle Bob´s tutorials on the Fitnesse site. After watching the Scenario table BDD tutorial I decided to try it out on my current project. What kind of tests are we talking about? I would characterize the tests I’m going to talk about here as Component tests. So they are not integrations tests, they rather test that the component we’re writing is doing what we expect it to do. As such, they are an excellent addition to our unit tests which tests our classes in isolation. Who are the tests for? The primary purpose of a component test is to aid developers to make the right code. But should the developer create these kind of tests for themselves? I think not. These kind of tests need to be carved out by resources with in-depth knowledge of the domain. Ultimately, I think that a joint effort between customer (possibly represented by a proxy), testers and developers gives the best result. A workshop before starting working on a feature is a good way to get this started. In addition, if we can express the tests in a natural language, we are increasing our chances of success. Given-when-then is a perfect fit for bridging the communication gap between business and developers. Given-when-then is a three step sentence where given is describing the pre-conditions, when is describing the action of the user and then the result of the action. The structure and the natural language makes it a good fit for bridging the gap between customers and developers. Cucumber has a great introduction to this construct. This page also links to another great post by Uncle Bob where he describes given-when-then as a finite state machine. I would argue that this is quite easy to read and it certainly communicates the intent of the user quite well. It is in a natural language and makes it therefore quite easy for customers to understand. In the following we will dive closer into how we can build tests in this manner using Fitnesse. We will first see how we can use Slim tables to do this. We then move on to see how we can improve things using the open source framework GivWenZen. But first, a very short description of the system under test. 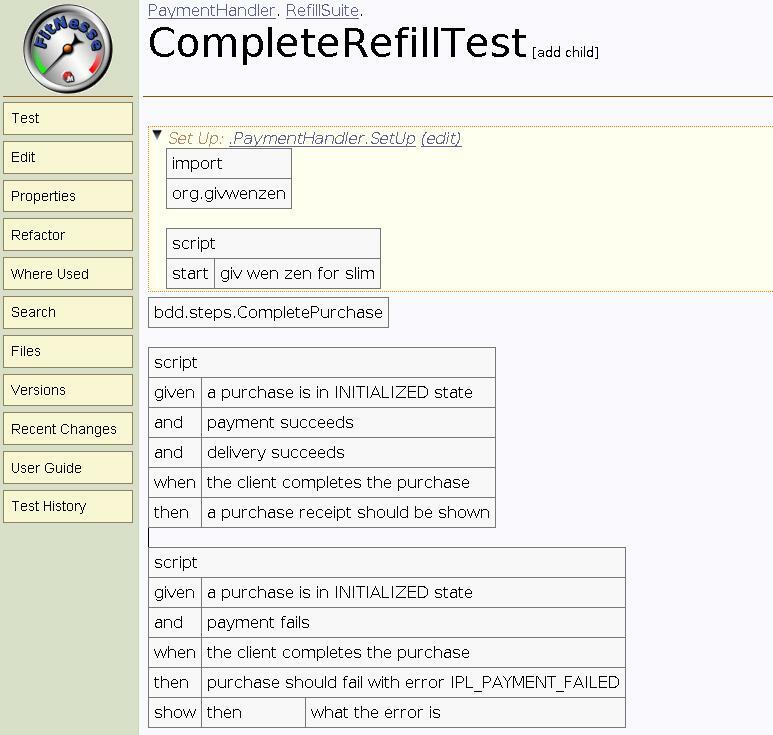 The component under test is that of a simple purchase system. From the web, customers can refill prepaid mobiles and pay it using a credit card (by redirection to third party solution). So conceptually we have a purchase that consists of a delivery of a product to a customer, and payment of the product. The purchase goes through a series of states, initialized and completed to name but a few. The key element for writing given-when-then style tests in Slim is Scenario tables. Scenario tables enable you to hide the technical details of the tests (like calling fixtures etc), allowing us to create tests revealing the true intent of the users. The first word is scenario, the rest of the first line is the signature where every second cell is a parameter, we’ll see how to invoke the scenario shortly. The second line is the body. This particular scenario will call method initializeRefillWithProduct and pass two arguments (telephoneNumber and product) to the method. Notice that the parmeters must be prefixed with the @ sign. A script table contains a series of actions and checks, it is similar to DoFixtures in Fit. This makes it a good fit for setting up our 3 step given-when-then scenarios, especially if we combine script tables with scenario tables, remember we can call scenarios from script tables. This way, we can hide the details of calling the fixtures from the script table and instead place it in our scenario table. Setting up GivWenZen to my already existing fitnesse configuration was easy, I simply made sure that all the libraries present in the zip download was on the classpath. It took a little while however before I realized that my Step classes needed to be in a package bdd.steps in order for the framework to pick it up correctly (according to the documentation one can override this location but I have not yet looked into this matter). I soon discovered that using the framework was surprisingly easy. 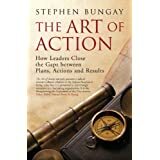 The framework is built around Step classes which contains Step methods. It uses regular expression matching to determine which step method to execute. To cut the story short: Instead of hiding complexity in scenario tables we hide the complexity in Java classes using annotations. Notice how the sentences in italic maps to steps in our step class. The first inserts a row in our in-memory database. The two next are a bit special. They defines behavior we expect from the system test in this specific case. The reason is simply that the payment and delivery system are external systems where we don´t control the data. Relying on data in these system can make our tests fragile. In the when clause we do the actual test. 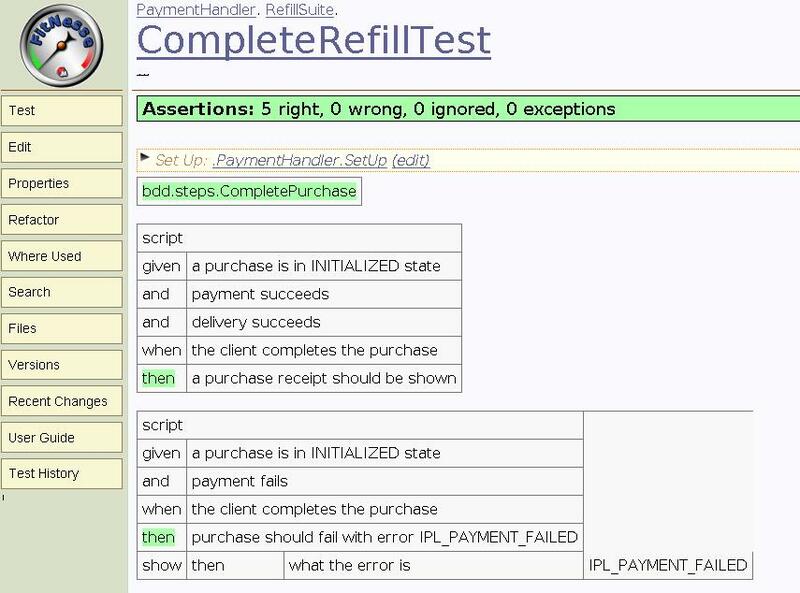 In this case we call the method completePurchase() on the endpoint class which is the entry point to the application. The “then row” is marked with a green color signaling that the test was successful. That´s it. One thing to note though: Since the domain steps are determined using regular expression matching you cannot have to identical steps. Something to watch out for. Having tried GivWenZen for a few days I´m really starting to like the library. It makes my tests compact and easy to use. The complexity is shifted from the fitnesse page to the java class, allowing us to express tests in a natural fluent language. It is a great starting point for communication and collaboration between customers and developers. Uncle Bob has started working in given-when-then table for Fitnesse Slim, the release date is yet not known but I´m sure it will be worth looking at once it is released. Previous postKanban – the next step in the agile evolution? hi Ketil, I have been playing with combining GivWenZen with scenario table and parameterized scenarios. I think I like the scenario table better than a parameterized but I still want to create some more examples. Take a look at the latest fitnesse example in the GivWenZen src. Thanks for using and writing about the tool. If you have any feedback or ideas please let me know. Thanks Wes, I’ll definitely look into your new examples. Is the GivWenZen still alive? No updates for a while. What about “Uncle Bob has started working in given-when-then table for Fitnesse Slim”? I have noticed the same thing. Not sure, but I think the project is dead. As for Uncle Bob’s work with Fitnesse I honestly don’t know what happened there. A lot of things has been happening in this area since I wrote this piece, Cucumber + a few other interesting tools. Ok. You mean that you haven’t used FitNesse since a while? Have you replaced usage of it by Cucumber or other tool?